See event invitation for details! 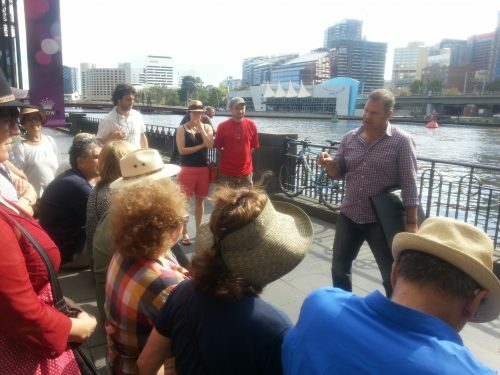 Don’t miss this great opportunity to join this leisurely two hour Cultural walk, beginning at the small, but very significant site of Enterprize Park on Southbank, part of the ancestral lands of the Kulin people which we today call Melbourne. This engaging journey peels away the layers of time and the dramatic irrevocable changes of both people, and place. It evokes the memories of a vibrant natural and cultural landscape. A memory that now lies beneath our urban existence of today. Come and dispel some old misunderstandings for yourself, hear the stories, and see the city with new eyes. ‘Walkin the Birrarung’ is not only a cultural and historical journey but is an intimate personal one connecting everyone regardless of age or background back to a connection with Place. Find Melbourne’s waterfall, its rich wetlands, its Aboriginal people, its deeper spirit. Dean Stewart, one of our PTGAA members, is a passionate Wemba Wemba-Wergaia man of Victoria, with over 25 years’ experience creating, coordinating and conducting Cultural Education, tourism, conservation and interpretation programs and projects. As one of the only truly Aboriginal owned and operated endeavours of this type operating in Melbourne’s CBD, he gives his voice and perceptions to his own culture and community.